At Johnson & Johnson we believe that breakthrough solutions that will shape the future of healthcare require partnerships. Our strong, longstanding partnerships give proof that banding together with others, uniting under a common purpose, sharing knowledge and combining reach can bring results. The size, breadth and diversity of our Company, its people and its products, places us in a unique position to mobilize and convene truly unconventional collaborations that can influence change at scale. We work with a wide range of stakeholders who are impacting health, including governments, nonprofit partners, multinationals, noted influencers, youth organizations, other private-sector organizations and foundations. We mobilize partners through co-development of initiatives, financial support, activation of our large employee base, and advocacy for priority health issues. This high-touch partnership model increases the likelihood of impact on the ground, sustainability and scalability of successful programs. Our collective efforts serve to unlock new solutions with even greater potential to address difficult health challenges. Support the delivery of 6 million eye care screenings to underserved children and corrective treatments (spectacles) as needed to 100,000 underserved children. In partnership with Lions Club International, supported delivery of 4.2 million eye care screenings and 53,000 corrective treatments (spectacles) to underserved children. The hallmarks of our global partnership with Save the Children are the deeply collaborative nature of our programs, and the priority we place on addressing the needs of the most vulnerable children. One of our signature collaborative partnerships is Survive & Thrive with Save the Children, the American Academy of Pediatrics, USAID, and Laerdal Global Health – developed to ensure safe pregnancy and birth. The suite of programs developed through these partnerships, called Helping Babies Survive, have been proven to reduce neonatal mortality in resource-limited environments, particularly in relation to the three most common causes of preventable neonatal deaths: complications during childbirth, complications from preterm birth, and neonatal infections. One of the signature programs under the HBS umbrella is Essential Care for Every Baby. Through this program, we equip healthcare providers with both skills and materials to ensure that mothers and babies survive childbirth, and to help new mothers keep newborns healthy and thriving during the first critical month of life. Collaborate with government, nonprofit and private sector to foster new models of health that improve economic well-being and healthcare in key emerging markets. Activate signature partnerships/initiatives for five of our largest Consumer brands to promote the health and well-being of people in need around the world. JOHNSON'S and LISTERINE brands each activated partnerships, including digital marketing, social media, public relations, retail / shopper marketing and packaging activities. Partnering with Operation Smile is a perfect example of how we demonstrate Our Credo in action. Over the past three decades, the Johnson & Johnson Family of Companies has helped Operation Smile provide smiles to children around the world through product, financial and employee support. In 2017, we helped Operation Smile celebrate 35 years of dedication and service to helping children born with cleft lips and palates. By initiating a 35th anniversary pledge, Johnson & Johnson encouraged employees to sign up and pledge to help raise awareness for Operation Smile's activities. They could pledge also to help build accountability among key Ministries of Health and world leaders for making access to safe surgery a global priority. In November 2017, we commemorated Operation Smile’s milestone anniversary by designating an annual day of giving dedicated to that organization, calling it "Smile Day." Employees across Canada, Japan, the UK and the United States were encouraged to participate in a program we called "Donate a Photo." Every photo donated through the Johnson & Johnson Mobile App for Social Good would trigger a US$1 gift from our Company to Operation Smile. This celebratory day was in addition to our annual Smile Week, held in May, when we set a company-wide global goal to support a target number of smiles through local and regional efforts, including raffles, fun runs and activities. Our commitment to Operation Smile and its mission doesn’t end there. Over the last five years, we have expanded our partnership to include mobilizing the caring power of our associates in support of this humanitarian work through funding medical missions. Johnson & Johnson is dedicated to helping communities and causes globally, so that people can live longer, healthier, happier lives. Donate a Photo is one way we connect people to nonprofits, increasing awareness and resources for deserving causes. Take a photo, make an impact. For every photo shared through the Donate a Photo app, Johnson & Johnson gives US$1 to a cause across eight categories of giving. It is our goal that by 2030, through Donate a Photo, we’ll have helped build a world where a healthy mind, body, and environment are within reach for everyone, everywhere. Donate a Photo is available in Japan, North America and the UK, and is helping to support over 150 causes. Since 2016, Johnson & Johnson has been proud to partner with social action platform Global Citizen to help give every man, woman and child around the globe an opportunity for a healthier future. This global partnership seeks to drive large-scale change to help solve the world’s most pressing public health challenges, including the global health threats related to infectious disease. In 2017, the partnership culminated in two major events. One was the Global Citizen Festival in Germany leading up to the G20 Summit, where we reinforced the importance of and our commitment to pandemic preparedness, including the readiness of two million doses of our Ebola vaccine. The second event was the Global Citizen Festival in New York, where we focused on our work to #makeHIVhistory, and announced the imminent launch of our large-scale efficacy testing of an HIV vaccine in humans. Donate a Photo was on hand to help raise awareness, and to build support for our work to address this important public health issue. 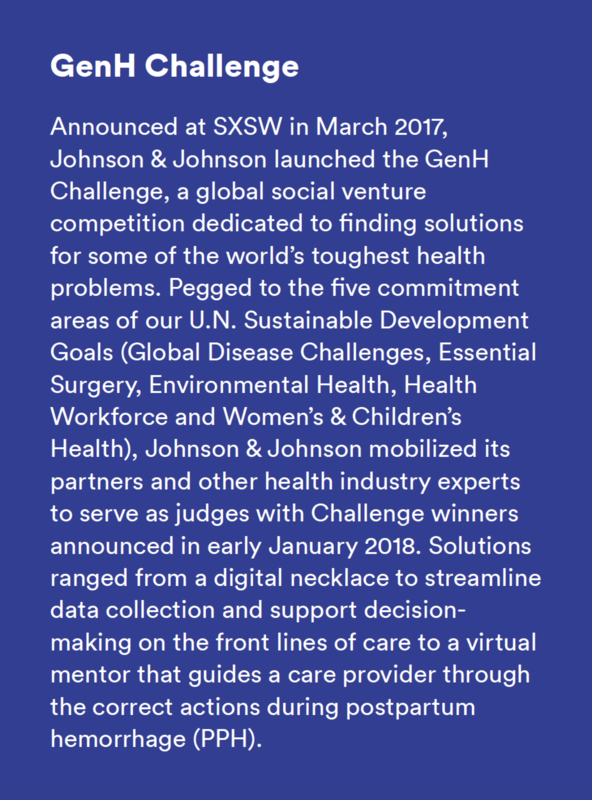 At Johnson & Johnson, we are uniquely positioned to apply our capabilities to help enable large-scale change for good. One way we are doing that is through the creation of CARINGCROWD, a free crowdfunding platform for non-profit organizations and entirely dedicated to improving global public health. Anyone in the world can make a pledge on CARINGCROWD, and Johnson & Johnson provides substantial opportunities for pledges to be matched. As of 2017, we count 4,504 CARINGCROWD members, with $577,566 pledged by individuals and $280,121 matched by Johnson & Johnson for individual pledges that have successfully funded 102 projects around the world. CARINGCROWD received the SXSW Interactive Innovation People's Choice Award at the 20th annual SXSW Interactive Innovation Awards. Out of 65 finalists, CARINGCROWD was voted the winner by the SXSW Interactive community on March 12. Known for celebrating the most inspiring, creative advancements of the year, the SXSW Interactive Innovation Awards embrace the evolving scope of the digital industry. In 2017, we celebrated the 15-year anniversary of the Campaign for Nursing's Future, an advocacy campaign that works to enhance the image of nursing as a profession. 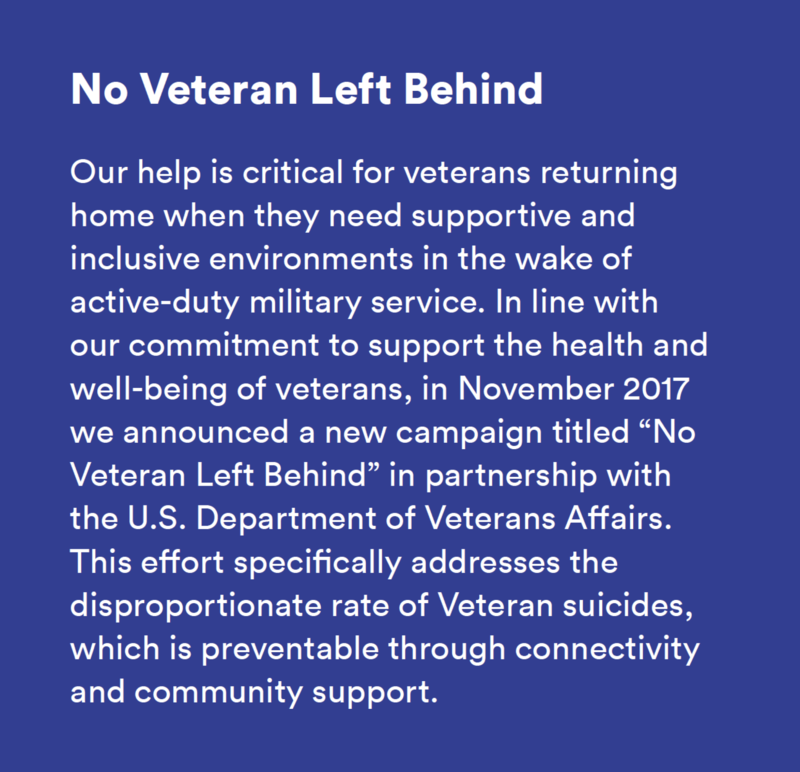 Read more about the Campaign in our Supporting the Front Lines of Healthcare section.